Day 58. 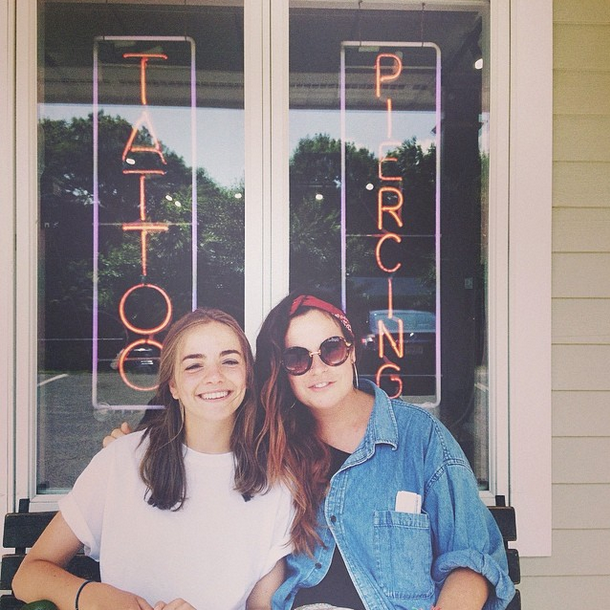 July 22nd ’14: It’s Tattoo Time! Day off, day off, day off! Got up early to come for breakfast at Irving in Millerton. Bacon and egg on a roll. Best thing ever. I’m sure I’ve said that before? I’ve borrowed Keith’s car and we’re going to go to Great Barrington for tattoos and piercings. Yay! Very excited. Just left the tattoo place – South County Tattoos. Love this place. Me and Charlotte got tats here last summer too. So happy right now. Took a while to get what I wanted exactly right and then the actual tattoo took so much longer than I thought it would, but I think everyone had a good time. Rosa, Becky & Anne all got their noses peirced (luckily the piercer was nearby and agreed to come in especially to do it), and I got my coordinates down the back of my neck. The left side is where I live in London and the right side is where I sleep at camp – Junior Girls forever! I absolutely LOVE it! So happy I finally managed to get it done. Back at camp now, just chilling until I have to start work again. I quite like coming back and just sitting in the tent for 10 minutes to breathe a bit before going back to the mayhem of the office and the mountain of stuff I have to do! Had a banging headache pretty much since we left GB earlier, so took some pretty strong pills for it which now means I’m finding it very hard to stay awake. Felt like such a zombie all through dinner. So I’m going to go and have a little nap and then get up and do some work a bit later I think. It currently feels like the ground is moving. In the office in my PJs. Went to sleep for about 2 hours, had a shower (ouchies on the tattoo) and then came down here to tick some things off my to do list. Kinda very wide awake now… I’n not going to get back to sleep for ages, I know it. Wow, that’s dedication to your camp! 🙂 I’m impressed! Haha thanks! It is pretty much my favourite place on earth, so it seemed kinda fitting!